3/5/07 Denver at islandexpeditions, Thanks for the reply. Yes, the 5-day/6-nights lodge-based Paradise Islands trip (as described at www.tobaccocaye.com to http://www.islandexpeditions.com/ie-tripdesc-paradise.html ) where some people could snorkel just from shore and transit between islands via motor boat, combined w/ the 2-day/2-nights Maya World extension http://www.islandexpeditions.com/ie-tripdesc-maya.html should work for all then. 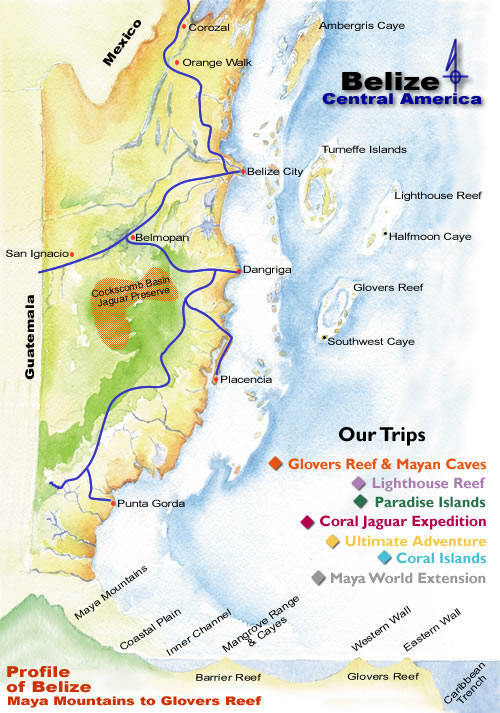 Since we were thinking about a 10-12 day trip total, perhaps we could add a day or two on the water, and a day or two inland, perhaps visiting the Cockscomb Basin Jaguar Preserve (as described at http://www.islandexpeditions.com/ie-tripdesc-coraltorain.html ). We are targeting beginning the trip in mid-April (i.e., will spend 10-12 days during the 13-30th of April) 2008. This date window now seems pretty firm. Norma (& Peter) 3/2/07 -"I think we ( or I) could go beginning mid-April. I am perfectly O.K. with camping." Mike - "can go anytime, stay anywhere"
Wendy - "you tell me I'll go"
Karen R. - 3/3/07 - "anything in 2008 works"
Greg Grilli (added 3/3/07) - ??? We can work out something like that for sure. Have a look at our Paradise Islands Trip. Lodge based on the reef. Snorkeling can be done from the land at both island locations. Motor boat between islands is possible. Denver... You will see I am thinking of a custom tour where (1) each night is spent in a lodge versus camping, and (2) a few of the participants could elect to transport between islands/lodging via motor boat. Is this practical? One of the participants is not a swimmer - but kayaks locally in Morro Bay, CA, and also has snorkeled on past trips with a flotation device. I'd be interested in your comment on this. Interested: Mike, Norma and Peter?, Wendy, Sylvia, Randy, Karen R. , Ron and Mary? $2000 NEW Itinerary! Ultimate Adventure - 9 Days / 10 Nights - http://www.islandexpeditions.com/ie-tripdesc-ultimateadven.html- youll sea kayak, snorkel, dive, windsurf, hike through the rainforest, explore Mayan ruins and ceremonial caves and descend an incomparable tropical river through canyons and lush rainforest. - Although no previous experience or special skills are needed to participate in the Ultimate Adventure, you should be in good enough physical condition to paddle up to 10 miles a day or hike with a light pack for three or four hours. Group Size: 6-14; Sea Kayaking (paddling & sailing), Snorkeling, Fishing, Paddling a Rainforest River, Hiking, Caving, Rainforest Trails, Birding, Photography, Natural History Interpretation. Several of the participants expressed concern about comfort level and capability with regards to the kayaking and snorkeling water activities, and/or a desire to stay in more traditional "lodge" accommodations versus "camping." I want to re-open the discussion for April, 2008. I contacted http://www.islandexpeditions.com/ and present to following Q&A for your edification. 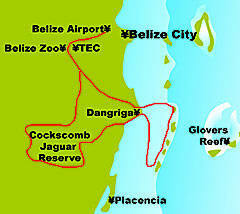 Q: I am starting to organize a group trip to Belize - we are thinking of visiting during May of 2008. I see that most of your trips are scheduled only through Dec. - April - is the weather not good enough go go in May? A: We generally operate during the most predictable weather months from December to April. We will consider extending into May. Statistically speaking, hurricane or tropical storm season peaks in Mid September. The rainy or wet season coincides. So 2 to 3 months either side of this is wetter than the rest. At the end of the rainy season, December on... jungle rivers are running high and make for the most fun. By May the waters are very low and some rivers cannot be paddled. On the flip side fare weather winds, water and air clarity are best and most consistent through until April and May. Our base camps at Glovers and Lighthouse Reef Atolls close at the end of April. We can extend this a week or so if it is worth our while. Q: Some have limited comfort in the water or ability to kayak 10 miles and might prefer a tour organized so that paddle outings could be optional for part of the group. A: An alternative may be a self guided trip for some or all. We do outfit. Look here: www.belizekayaking.com. Q: I'm thinking that we might be a self-contained group and could create a custom itinerary. A: Custom itineraries are no problem. (1) I need to know if everyone who wants to go could in fact go in early April 2008 instead of May 2008. (Remember, we ruled out November earlier). (2) As a more tame alternative (i.e., lodging vs. camping, and the possibility of passing on some kayak outings) to the proposed Ultimate Adventure - 9 Days / 10 Nights, consider the following Paradise Islands + Maya World Extension - are you comfortable with this as a base for planning a custom trip? (I'm assuming we could negotiate for passage between islands/lodges via motor boat for those not wanting to kayak). Experience the best of Belize that most travelers miss. Our Belize adventures on the barrier reef include kayaking, sailing, and snorkeling. Explore incomparable Lighthouse Reef and Glovers' Reef Atoll from our private island base-camps. 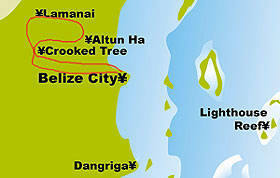 Listen for the lost echoes of the Maya through forty centuries of silence in the ruins of Belize. Our 7 day to 10 day Belize trips on the coral reefs and atolls introduce you to the exciting world of sea kayaking, kayak sailing, snorkeling, scuba diving, c-breathe diving, yoga, salt water sportfishing and windsurfing in the tropics. In the Maya Mountains of Southern Belize, our adventures offer river kayaking, hiking, caving, Mayan ruins, cultural interaction, wildlife spotting, and excellent photography. $1900 Coral Jaguar Expedition - 10 Days / 11 Nights: Sea Kayaking (Paddling & Sailing), Snorkeling, Fishing, River Travel, Whitewater, Hiking, Mayan culture, Birding, Photography, Wildlife & Natural History Interpretation. $1600 Glover's Reef & Mayan Caves - 7 Days / 8 Nights: spend six and a half days sea kayaking and kayak sailing, snorkeling, diving, and fishing.